And now with major US refiners dumping crude, as we detailed overnight, those fears are surging. U.S. Energy Information Administration data on Wednesday showed inventories at the Cushing, Oklahoma delivery hub hit a record 64.7 million barrels last week - just 8 million barrels shy of its theoretical limit - stoking concerns that tanks may overflow in coming weeks. 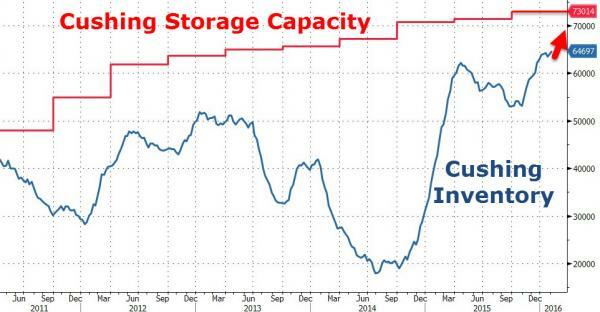 Simply put, as one trader noted, speculators are now "making the leap to Cushing storage never being more full... will actually overfill, or even stop taking crude oil deliveries outright."